Asian food is all about balancing sweet, salty and sour flavours and this caramel dressing does just that. The tamarind offers a sourness and the fish and soy sauce chip in with their saltiness. 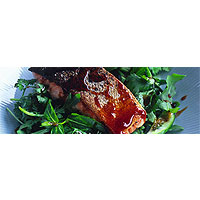 Salmon has a really gutsy flavour so it pairs up well with this dark dressing, which is as thick as treacle. To make the dressing, heat the oil in a small saucepan over a medium heat. Add the ginger and cook, stirring, for 30 seconds. Add the soy and brown sugar, and stir to dissolve the sugar. Add the fish sauce and tamarind and continue stirring until dark and syrupy. Remove and set aside to cool slightly. Place a frying pan over a medium-high heat for 2 minutes. Brush the salmon with oil and season with salt and pepper. Cook the salmon for 3 minutes, skin side down, then cook for another minute on the other side. Remove from the pan and leave to rest for 2 minutes. The flesh should be rare and the skin crispy. Place the rocket, cucumber, coriander and mint in a medium bowl and toss to combine. Divide the salad between 4 serving plates and top each with a piece of crispy salmon. Drizzle over some of the tamarind dressing and serve immediately. A touch of residual sugar in this wine helps parry the sweetness of the dressing, while having enough exotic fruit to cope with the meatiness of the fish.